By learning how to make garden stepping stones, you can build a path that's attractive and inexpensive. It's easy, to boot. But first, let me point out that we're not talking about slabs of natural rock in this project (although it's a great material for informal walkways in its own right). Concrete is sometimes poured into a mold to make garden stepping stones. Others, more interested in saving time and energy than money, buy pavers suitable for use as garden stepping stones. I've even seen logs cut up into medallions to make garden stepping stones, although wood certainly wouldn't be my choice for a material in damp climates. Why Use Stepping Stones to Build a Path? Garden stepping stones are easy to make. If you can mix concrete, then you can make garden stepping stones. 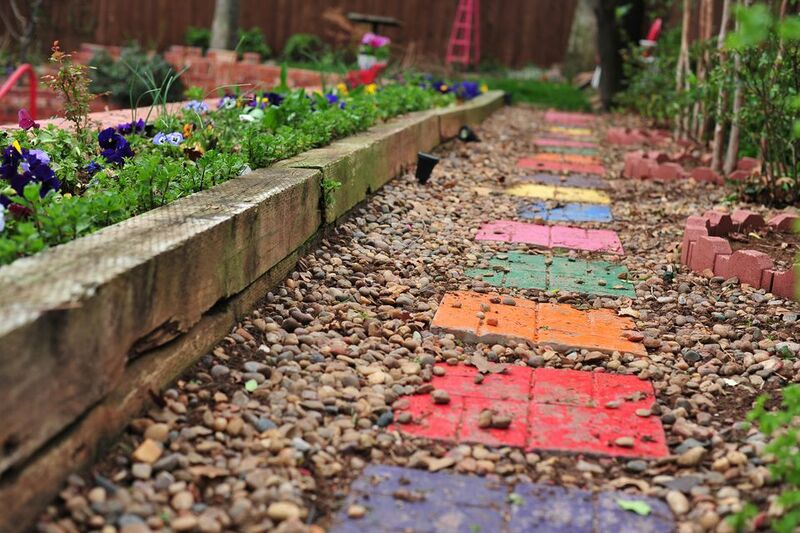 You can thus add a decorative element to your yard by using homemade garden stepping stones. Natural rock affords less opportunity for creativity but can be just as aesthetically pleasing. Whether laying natural rock or homemade garden stepping stones, the process of building the path is easy, as is maintaining it. In unmulched planting beds: garden stepping stones will reduce the amount of dirt tracked into the house. In mulched planting beds: mulch particles can also be tracked into the house in wet weather; use garden stepping stones to address this problem. In the lawn: garden stepping stones will absorb the pounding of foot traffic, saving your grass from compaction problems. The picture (above right) demonstrates the use of garden stepping stones in a planting bed with no mulch. The plants growing in between in the picture are varieties of creeping thyme, which I planted after laying the garden stepping stones. I selected them not only for their height, but for their fragrance: when your feet make contact with the thyme, the pleasing aroma will be released. Eventually, the thyme will spread and fill in the area, essentially functioning as a living mulch. Making garden stepping stones is easy and great fun. In fact, as mentioned previously, you can involve the kids in making them, but be sure to keep safety foremost in mind (for both yourself and the kids). To that end, let's begin with a list of safety tips and safety supplies that will come in handy. When lifting concrete (whether it's still in the bag or already fashioned into garden stepping stones), keep a straight back, bend your knees and cradle the load up against your torso (wear old long-sleeved shirt and long pants). Concrete dust can be caustic, so wear protective eyewear, gloves and a face mask. Tight-fitting children's gloves will come in especially handy if you want a child's handprint to adorn your garden stepping stones. Making garden stepping stones requires little in the way of materials. In the materials list I supply below, #8 is optional: a small piece of chicken wire can be placed into the middle of your mold-mix so that concrete cures around it; the result is a more durable garden stepping stone. Also optional is #9 (since it pertains to decoration). I tried a concrete coloring agent on one of my garden stepping stones. Using more than one mold will greatly expedite the process of making garden stepping stones. Not only does each garden stepping stone have to "wait its turn" if there's only one mold, but you'll also have to mix separate batches of concrete. When searching for molds of a suitable size, remember that garden stepping stones should be about 2" thick and 16"-18" wide. Concrete coloring agent, patio paint, or decorations to press into the concrete. Find mold(s). Commercial molds are available in craft stores, but you can also improvise. I used a saucer from a large plastic plant container. "Grease" the inside of the mold with vaseline or cooking spray for easy removal of the garden stepping stones after the concrete dries. Pour some pre-mixed concrete into a wheelbarrow or tub for mixing. In mixing concrete, just add a little water at a time. Thrust the shovel underneath the concrete and fold it over on itself, distributing the wetness. Continue adding small amounts of water and mixing until all the concrete looks the same and it achieves a consistency that is neither dry nor soupy. If too dry, the channel walls will be crumbly; add more water and mix. If too wet, the channel fills in with water; add more concrete and mix. When the concrete is ready, pour it into the mold(s) you've chosen for your garden stepping stones. Tamp it down as you go to remove air bubbles. Using a short 2x4 (or something similar), screed the excess off the top. Approximately 45 minutes later, you can press decorative elements into your garden stepping stones (e.g., marbles), if you desire, or make those ever-popular hand prints! Repeat for other molds (if working with more than one). Allow 2 or 3 days of undisturbed drying for your garden stepping stones (premature moving of the molds may cause cracking). When you're ready to remove the garden stepping stones from their molds, gently flip the molds upside down and tap all around on them, lightly. Eventually, you should be able to lift the molds off the completed garden stepping stones. Now let the concrete finish "curing" for another week before subjecting your garden stepping stones to any rough treatment (such as walking on them). In unmulched planting beds: concrete stepping stones reduce the amount of dirt tracked into the house. In mulched planting beds: to reduce the amount of mulch particles tracked into the house in wet weather. In the lawn: concrete stepping stones absorb the pounding of foot traffic, saving grass from compaction problems. Concrete stepping stones will also aid you in your efforts at attracting butterflies. Butterflies are cold-blooded, and they'll be able to warm themselves on any hardscape elements that absorb heat. On the present page I focus on the use of concrete stepping stones in lawn areas (see photo at right). In garden areas, laying concrete stepping stones is a rather straightforward project. Wherever you wish to have a garden path, simply sink the concrete stepping stones into the soil or into the mulch. True, the concrete stepping stones will shift over time; however, the necessary adjustment will be simple enough in such areas, where the medium (loam or mulch) is loose and where access is easy. There's a bit more to consider when using concrete stepping stones in lawn areas. Still, it's worth the extra effort. If you have children who are active outdoors, perhaps a "beaten path" already mars your lawn's appearance. So take the "path of least resistance" and install a concrete stepping stone path! Where such beaten paths already exist, the question of path location has already been answered for you. Otherwise, you'll have to decide what the most convenient location would be. E.g., depending upon the lay of the land and how it's used, people may want walkways leading from driveways or streets to front door entrances. Next you'll have to answer the question, Do I want my concrete stepping stone path to be straight or winding? Where aesthetic concerns play an important role, most people choose the winding-path style (this holds true in garden areas, too). The exception would be for paths following the more formal, balanced design typical of paths leading from the street to the front door. To lay out a winding path, use old garden hoses to define the sides; guided by the hoses, spray-paint the lines in. For the straight-path style, use stakes and string for layout. The next question you have to tackle is, Do I want my concrete stepping stone path to have an informal or formal design? How you answer this question may depend on whether you prefer informal or formal landscape design, in general. Essentially, there are two basic approaches to laying such paths in lawns. One approach (the "informal") is to excavate only those spots where the concrete stepping stones will rest, allowing the grass to continue to grow between them. The other, more "formal" approach involves excavating the whole path. You'll want to space your concrete stepping stones in such a way as to accomodate the average human's stride. Spacing them 24" on center is just about right for most people. Begin by placing a few of the concrete stepping stones on top of, say, one quarter of the projected path. Then try them out! See if you can walk over them comfortably, using a normal gait. Adjust as necessary. If five concrete stepping stones were required to fill one quarter of the path, then you know you'll need to make about twenty in all. So if you want to have all your concrete stepping stones formed first, before installation, go back to your molds and get busy! Others may prefer to take it one piece at a time. Once a concrete stepping stone is laid out where you want it, you need to mark that spot. Simply jab a knife or a spade through the grass, all along the perimeter. Remove the concrete stepping stone and excavate. For a two-inch thick concrete stepping stone, dig down 2". At the bottom of your hole, add a 1/2" layer of sand. The sand provides some drainage. Sand is also easier to work with than soil as a base, should you have to make height adjustments over time. Such adjustments are often necessary, as the level of concrete stepping stones will change over time as a result of foot traffic and (in cold climates) the freeze-thaw cycle. At some point, you may have to add more sand, as the old sand works its way into the surrounding soil. Note that the 1/2" layer of sand pushes the concrete stepping stones up 1/2" above ground level. This level is high enough to keep them from becoming "lost," but low enough that you can run the lawn mower right over them. For the sake of low-maintenance landscaping, you want to make sure your concrete stepping stones don't become obstacles when you have to mow!